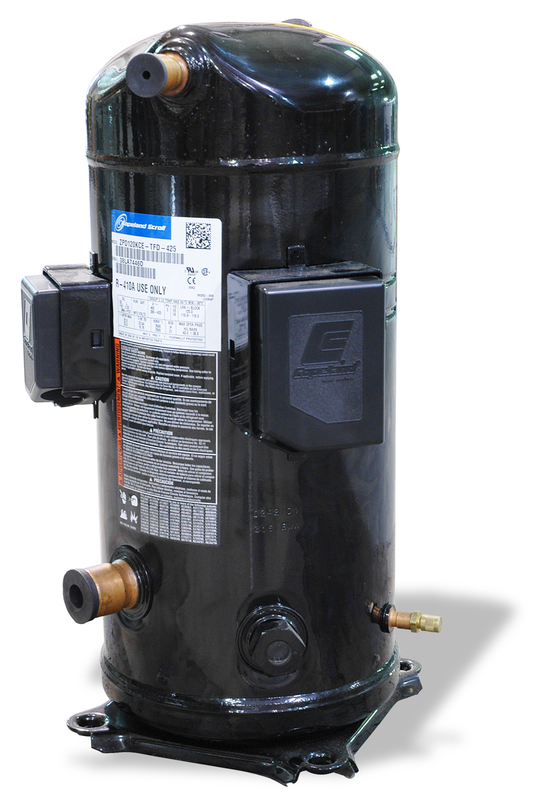 Copeland Scroll compressors are used on most Advantage portable and central water chillers, from 3 to 90 tons, air cooled and water cooled units. Have only three moving parts. Fewer moving parts mean increased reliability. By comparison, piston compressors have up to nine moving parts per cylinder. Benefit: fewer maintenance calls. Do not use complex internal suction and discharge valves. Because of this, scroll compressors are more tolerant to liquid refrigerant and debris. Benefit: durability. Are more efficient over their entire operating range, thanks to less cycling and 100% volumetric efficiency. Benefit: higher efficiency. Are compact in overall size, are light weight, and are simple in design. Benefit: easy service and maintenance. Operate at a lower sound and vibration levels. Benefit: quiet operation. 1. Refrigerant enters outer opening as one scroll orbits the other. 2. The open passage is sealed and refrigerant is drawninto the compression chamber. 3. As one scroll continue orbiting, the refrigerant is compressed into an increasingly smaller, crescent-shaped pocket. 4. By the time the refrigerant reaches a central port in the stationary scroll, it has achieved maximum (discharge) pressure. 5. During actual operation, all passages are in various stages of compression at all times, resulting in near-continuous intake and discharge for optimum performance. For more information about Scroll Compressors call the Advantage Sales Department at 317-887-0729. Would you like to Download FYI #245 to your browser?